The pygmy marmoset is a small species of New World monkey native to rainforests of the western Amazon Basin in South America. The species is notable for being the smallest monkey and one of the smallest primates in the world, at just over 100 grams (3.5 oz) (Madame Berthe's mouse lemur is smaller). It is generally found in evergreen and river-edge forests and is a gum-feeding specialist, or a gummivore. About 83% of the pygmy marmoset population lives in stable troops of two to nine individuals, including a dominant male, a breeding female, and up to four successive litters of offspring. The modal size of a standard stable troop would be six individuals. Although most groups consist of family members, some may also include one or two additional adult members. Members of the group communicate using a complex system including vocal, chemical, and visual signals. Three main calling signals depend on the distance the call needs to travel. These monkeys may also make visual displays when threatened or to show dominance. Chemical signaling using secretions from glands on the chest and genital area allow the female to indicate to the male when she is able to reproduce. The female gives birth to twins twice a year and the parental care is shared between the group. The pygmy marmoset has been viewed as somewhat different from typical marmosets, most of which are classified in the genera Callithrix and Mico, and thus is accorded its own genus, Cebuella, within the family Callitrichidae. It is listed as Least Concern by the International Union for Conservation of Nature as it is common across its wide range and not at immediate risk of widespread decline. The biggest threats to the species are habitat loss and the pet trade. The pygmy marmoset is one of the world's smallest primates, and is the smallest true monkey, with a head-body length ranging from 117 to 152 mm (4.6 to 6.0 in) and a tail of 172 to 229 mm (6.8 to 9.0 in). The average adult body weight is just over 100 grams (3.5 oz) with the only sexual dimorphism of females being a little heavier. The fur colour is a mixture of brownish-gold, grey, and black on its back and head and yellow, orange, and tawny on its underparts. Its tail has black rings and its face has flecks of white on its cheeks and a white vertical line between its eyes. It has many adaptations for arboreal living including the ability to rotate its head 180 degrees and sharp claw-like nails used to cling to branches and trees. Its dental morphology is adapted to feeding on gum, with specialised incisors that are used to gouge trees and stimulate sap flow. Its cecum is larger than usual to allow for the greater period of time gum takes to break down in the stomach. The pygmy marmoset walks on all four limbs and can leap up to 5 m (16 ft) between branches. This monkey has a specialized diet of tree gum. It gnaws holes in the bark of appropriate trees and vines with its specialized dentition to elicit the production of gum. When the sap puddles up in the hole, it laps it up with its tongue. It also lies in wait for insects, especially butterflies, which are attracted to the sap holes. It supplements its diet with nectar and fruit. A group's home range is 0.1 to 0.4 hectares (0.25 to 0.99 acres), and feeding is usually concentrated on one or two trees at a time. When those become depleted, a group moves to a new home range. Brown-mantled tamarins are generally sympatric with pygmy marmosets and often raid pygmy marmosets' gum holes. Pygmy marmosets have adapted insect-like claws, known as tegulae, to engage in a high degree of claw-clinging behaviors associated with plant exudate exploitation. Exudate is any material that oozes out of a plant, including gum, sap, resin, and latex. Claw-clinging is primarily used during feeding, but also during plant exudate foraging. A pygmy marmoset group, ranging from two to nine members, contains one or two adult males and one or two adult females, including a single breeding female and her offspring. Interbirth interval ranges from 149–746 days. In contrast to other callitrichines, there is no relationship between the number of adult males and the number of infants and offspring. However, there is a significant positive relationship between the number of juveniles and the number of adult and subadult group members. Young marmosets typically remain in the group for two consecutive birth cycles. The pygmy marmoset uses special types of communication to give alerts and warning to its family members. These include chemical, vocal, and visual types of communication. It is believed to serve to promote group cohesion and avoidance of other groups. Infant pygmy marmosets, along with their parents, twin, and other siblings, form cooperative care groups. Babbling, or vocalizing, by the infant marmoset is a key part of its relationships with its family members and is a major part of its development. As the infant develops, the babbling gradually changes to resemble and eventually become adult vocalization. There are many similarities between the development of vocalization in infant pygmy marmosets and speech in infant humans. Vocalizing gives the infant advantages such as increased care and allows the entire family to coordinate their activities without seeing each other. Siblings also participate in infant care. Infant marmosets require the most attention, so having more family members participating in the care decreases the cost for any individual and also teaches parenting skills to the juvenile marmosets. Members of the group, usually female, may even put off their own reproduction through a temporary cessation of ovulation in order to care for the offspring of others in the group. The ideal number of caregivers for an infant marmoset has been shown to be around five individuals. Caregivers are responsible for finding food for the infants as well as helping the father watch for predators. The pygmy marmoset is a non-seasonal breeder and usually gives birth to twins once or twice a year. However, single births occur 16% of the time and triplet births 8% of the time. The pygmy marmoset is usually monogamous though there is some variation within the species in terms of breeding systems. Polyandry also occurs as male marmosets are responsible for carrying the infants on their backs. Having a second male to carry the offspring can be beneficial as marmoset litters are often twins and decreases the cost to any particular male. 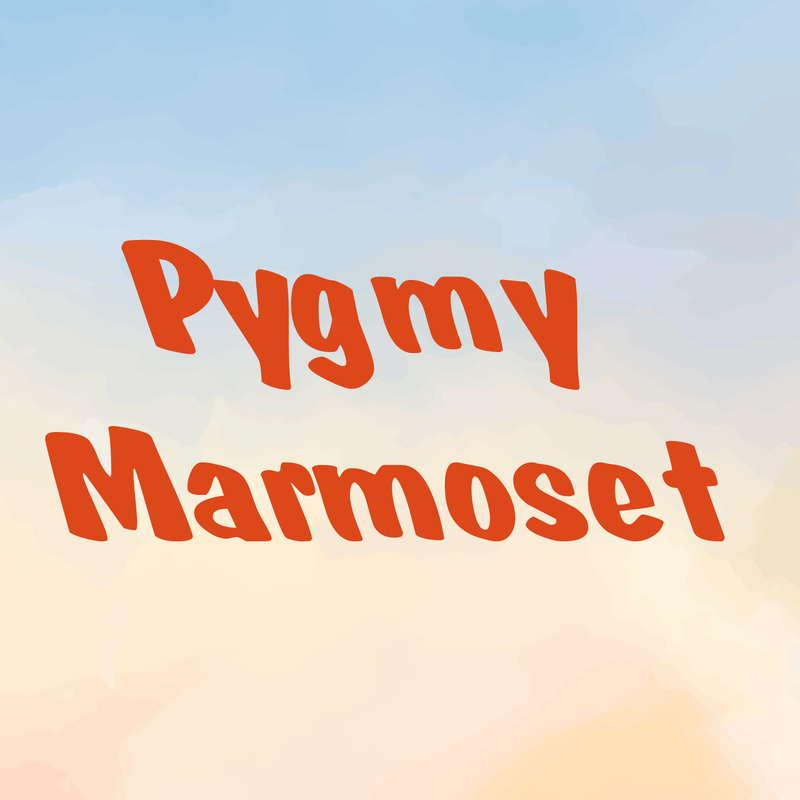 The daily range of the pygmy marmoset, however, is relatively small, which decreases the rate of polyandry. Male and female pygmy marmosets show differences in foraging and feeding behavior, although male and female dominance and aggressive behavior varies within the species. Males have less time to search out food sources and forage due to the constraints of their infant caring responsibilities and predator vigilance. Without an infant to carry, female pygmy marmosets have greater freedom to forage, giving them an apparent feeding priority. This priority may serve to compensate mothers for the energetic costs of carrying and lactating for two offspring at a time. However, the fact that feeding priority is also given to females without offspring weakens the argument. Instead, female feeding priority may have evolved through sexual selection. Females may choose mates who invest more time in infant care and predator vigilance. Such males have less time to look for food, allowing the female feeding priority.